Each year thousands of soldiers march over Red Square’s cobblestones and the parade shows off the country's military hardware. "How does vodka…," "Why did Putin…" RBTH has selected the most popular user search questions related to Russia. In the "Why Russia" series of articles we respond to each question in detail. Today we explain why the Victory Day Parade is still the largest event in Russia. When sociologists ask Russians what they are most proud of in their country’s history, the most popular response for the last twenty years has been the victory in the Great Patriotic War, 1941-1945. Therefore, it’s no surprise that Victory Day - celebrating the defeat of Nazi Germany - on May 9 is one of the most popular celebrations in Russia. The holiday unites people from all walks of life and about 24 million people - one out of every six Russians - participated in the 2016 Victory Day celebrations. One of the most recognized images of the celebration, along with the evening fireworks and the carnations given out to veterans, is parade that rumbles through Moscow. Each year thousands of soldiers march over Red Square’s cobblestones and the parade shows off the country's military hardware, like the “Armata” tank in 2015. The defense minister (who today is Sergei Shoigu) always participates in the parade. On the 70th anniversary of Victory Day in 2015, Russia spent 810 million rubles ($14.2 million). The following year the country spent 295 million ($5.1 million). The scale of the event is massive. Western Europe and the U.S. do not celebrate the end of WWII with large military processions. China held a huge military parade in Sept. 2015 in honor of the 70th anniversary of the end of WWII, but this was a one-off event. So why does Russia go all out in celebrating the date? As strange as it sounds, in the USSR (the victor in the Great Patriotic War) parades were more modest than in modern day Russia - and rarer. After the first Victory Parade was held in June 1945 on Red Square, in which the Soviet soldiers deposited the Nazi banners at the feet of the Mausoleum, the country did not hold a parade for 20 years. As historian Denis Babichenko says, both Joseph Stalin and his successor Nikita Khrushchev feared that the Great Patriotic War commanders would strengthen their positions and therefore did not focus everyone's attention on their and other veterans' merits. It wasn’t until 1965 that Victory Day became a holiday. The first Soviet leader, during whose tenure Victory Day became a nationwide celebration, was Leonid Brezhnev (he was General Secretary, the highest rank in the USSR, from 1966 to 1982). But in Brezhnev's time the parade was held only on jubilee years. The last Soviet parade took place in 1990 and in the first several years of the “new Russia” there were no processions at all. They were fired up again in 1995 and only in the 2000s did they reach today's level. 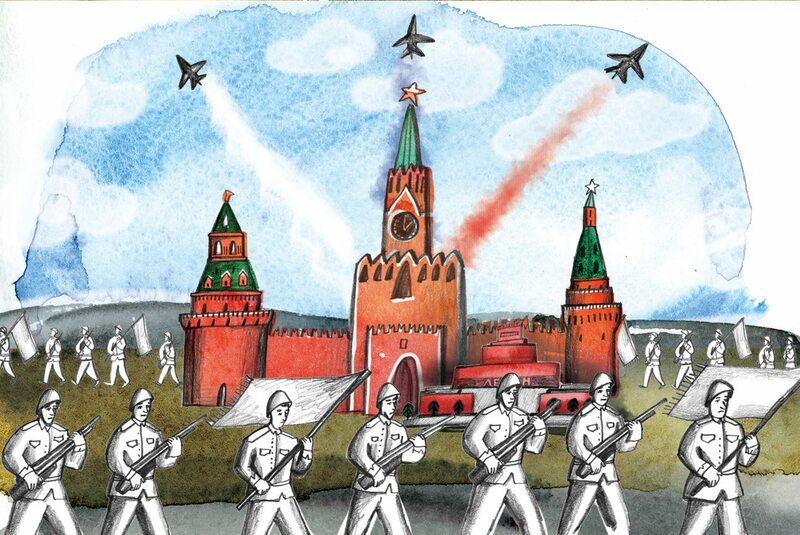 Historian Dmitri Andreev notes that for today's Russia, Victory Day brings the nation together. "Victory Day and the memories associated with it create the impulse of national unity and accord," Andreev explains. The parade, the fireworks, the Immortal Regiment procession - all these rituals embody the idea of togetherness. The government emphasises these rituals to preserve identity. Muscovites sometimes complain that it’s inconvenient to watch the parade live. "You can't get up close, can't see anything," remarks blogger Ilya Varlamov. "This is done not for the people, but for the TV. Why can't they organize stands for ordinary people?" Varlamov also criticizes the government for combining Victory Day, the holiday related to memory and grief, with "the demonstration of military might." But the overwhelming majority of Russians (96 percent, according to a Levada Center survey) back the parade. "Back in my childhood my parents and I watched the parade every year," remembers Yulia Kovaleva, a 24-year-old Muscovite. "It's nice to watch how the guys march in sync, to look at the powerful technology, hear the 'hurrays!' You feel proud, protected. It's a good tradition and it should be continued."